The Lower Kuskokwim School District (LKSD) and the University of Alaska Fairbanks have teamed up to try and solve two problems with one new program. The aim is to address high rates of teacher turnover, as well as to improve Yup’ik cultural and language competency among the region’s teaching staff. 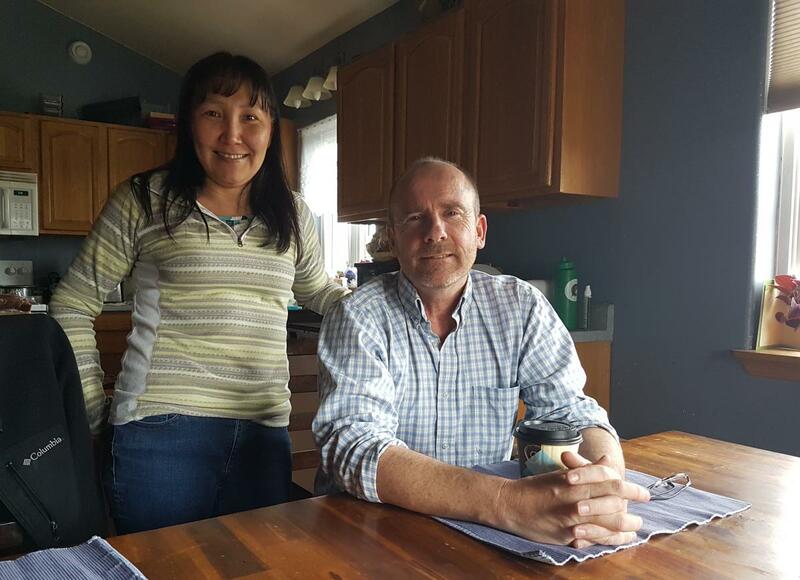 On a quiet Tuesday afternoon in Bethel, Isabelle and Hugh Dyment are at home taking time to catch up on some household chores and studying while their five kids are off at various summer camp programs. “I have this big paper that I need to work on,” said Isabelle Dyment, an assistant teacher in LKSD’s Two and Done program. Isabelle sits on the couch, reading and taking notes for her essay, while Hugh does the dishes and makes coffee. Isabelle is one of the first four assistant level teachers in the Two and Done Program. She is trying to finish her bachelor’s degree in Education and become an Alaska state-certified teacher, and is a little more than halfway through the two-year program. “I had to do a time management – I had to put time for homework time and dealing with the kids, the chores, the household stuff that needs to be taken care of,” Dyment said. The Two and Done Program is designed for people like Isabelle, who speaks Yup’ik fluently, works in the district, and is two years or less away from getting a teaching certificate. Before becoming part of the program, Dyment took nine credits a year while working full time as an assistant teacher at the Ayaprun Yup’ik Immersion School. Her husband Hugh is the Dean of Students at the Kuskokwim Learning Academy, an alternative boarding school located at the Yuut Elitnaurviat facility in Bethel. The Dyments knew that the Two and Done Program would be a big adjustment for them. 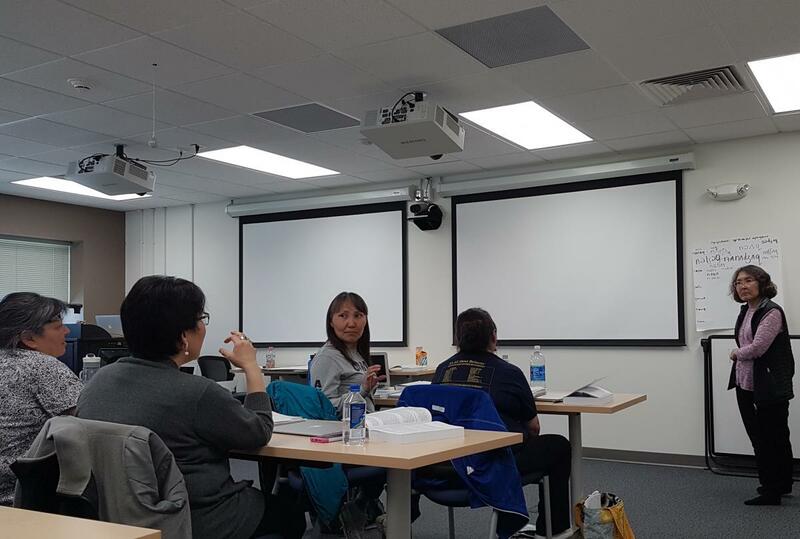 The program, offered by the Lower Kuskokwim School District, is designed to speed up the process of earning bachelor’s degrees and teaching certificates. The district pays assistant teachers like Isabelle a stipend to cover living expenses equivalent to her working wage, and also pays her tuition costs to go to school full time for two years. The schedule is grueling. Some days Isabelle is in class for eight to 10 hours. Hugh takes up the slack at home. “I mean, it wasn’t impossible or anything. We’re not tidying up the house as much as we normally would,” said Hugh. Still, it was a big learning curve for both of them, said Hugh, as he’s had to learn the hard way how much he depends on his wife. “You have a [school] board that is investing in the future for our students, but investing in a way that is building teachers that are going to stay here, and work in our communities, and live in our communities,” said Josh Gill, Director of Personnel for LKSD and creator of the Two and Done Program. Gill says that the LKSD school board is committed to investing in local teachers fluent in Yup’ik who are more likely to stay in the YK Delta. To Gill, that’s important because a lot of teachers coming in from outside of the YK Delta, or even outside of the state, have a lot of adjusting to do. “I mean, literally, I’ve had people call and say, oh ya’ know, ‘do I need to have my car shipped out to the village,’ and you have to explain there’s no roads,” Gill said. The turnover rate is huge. Most of the teachers in the bush come from outside and stay at rural schools for two to three years at most. Jessica Glore is an Academic Advisor at the UAF Kuskokwim campus who also works with Isabelle Dyment. Glore is Yup’ik and grew up in the village of Kwigillingok. She recalls many teachers coming and going. “It was… it was bad. It affected me because I had teachers who put their time and their effort into me, and then they would transfer or they would move out of Alaska,” Glore said. Hugh Dyment, who is not Alaskan Native, is one of the exceptions to this trend. He has lived and taught in the region for over 25 years. “My whole career I’ve worked with, sort of, at risk troubled teens for various reasons. It’s been a real joy for me, but the reality is that they would benefit just as much from seeing a Native Yup’ik speaking teacher, and that would mean something to them,” Hugh said. Isabelle Dyment couldn’t agree more, as she stresses the importance of just being able to understand the students she works with. Sally Russell is the Assistant Director of the UAF Kuskokwim campus and has helped to oversee Dyment’s academic work. Russell is not Yup’ik and remembers having to unlearn being taught to move aggressively to control her classroom when she taught elementary school in the region. According to Russell, a Yup’ik teacher doesn’t need to learn the culturally appropriate way to manage Yup’ik children because they’re already aware of culture values and customs. This is part of why Russell thinks that the Two and Done Program is a good first step, and that it couldn’t come at a better time. “We have the largest region in the state with a Native language intact,” Russell said. Russell said that the old idea that speaking your language would interfere with learning English and school work is disappearing, because the research doesn’t support it. “There’s been a real resurgence in the Yup’ik language, and the educational decisions about that are driven by research that shows that children who are bilingual at a young age, or Yup’ik first language, will do much better in school if they at least start school up until third grade with a teacher who speaks their same home language,” Russell said. Jessica Glore goes further by saying that kids seeing adults in their community continuing their education and giving back to the community creates a major role model for students. Hugh Dyment said that he can already see this effect with the example his wife Isabelle has set in their home. LKSD has already selected the next group of four to begin the Two and Done program this coming fall.